Now I haven't said this in a year and a half, but you need to grab your car keys right now and head to the nearest freezer aisle. I don't care what time it is, I don't care if you aren't hungry, you need to get to the store right now. 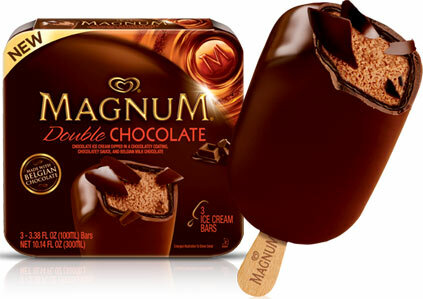 These magnum bars aren't just good, not just great, they are amazingly fantastically divine pieces of ice cream greatness. Now look at the bar. It looks like ice cream in a chocolate sauce and around that a chocolate coating. It seems different, but straight forward. However, read the description: chocolate ice cream dipped in a chocolaty coating, chocolaty sauce, and Belgian milk chocolate. Having trouble visualizing? let me help. OH YEAH!!!! snacking genius I tell you! A thin chocolate shell, a nice soft chocolate sauce, and then the double thick Belgian chocolate shell. Wrap it around some top notch creamy chocolate ice cream and you have snacking perfection. Brilliant, just brilliant. Whoever thought this one up needs a raise. It's just that good. There's just so much rich chocolate flavor here. Top that off with all these perfect textures. 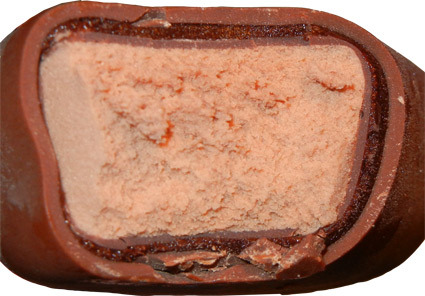 I adore the soft "filling" in between the crunchy shells, it's magnificent. I've been digging the new Pepperidge Farm dark Milano Melts because of the crunchy / gooey combo, and here I have that same idea in an ice cream. I don't mean to be easily amused, but it just amazes me somebody pulled this off. If you try nothing else this year, try these. And soon. like, tonight. tomorrow at the latest. I know why it comes in a gold wrapper now: because it's just that good! Alright, you know what you need to do this weekend. You need to try this bit of chocolaty perfection. why are you still reading? go get one! Nutritional info is terrible, but I have been on my feet all day and I haven't even had dinner, so whatever! On Second Scoop: Ok, I've calmed down and had another after a break on Saturday. These things are still excellent and rock a quality chocolate taste. Nice job Magnum. We used to get the Double Chocolate Magnum until two years ago and it was my favourite out of all the Magnum bars. I heard it will be making a comeback this year. I hope the rumour is true. Glad youve found a British Magnum product you really like! I love the Magnum Gold, they are heaven yum. I've tried every flavor BUT the chocolate! Ok, fixing this tomorrow. Thank God I can get them at the convenience store by my flat! Glad you liked it! Thanks for linking to my site. i normally wouldn't trust the opinion of someone who doesn't appreciate coffee, but your resounding praise for this has got it added to the shopping list. if it doesn't live up to your raves though, i expect to be financially compensated. I think we need the guaranteed "Dubba Seal of Approval" on this one.